At Best Doors & Prestige Garage Doors, we stock and install a huge range of sectional door motors for automatic access systems, including some of the best known and most reliable brands, including Gliderol, B&D and ATA. Gliderol's Glidermatic GTS 2000 overhead door operator is a sophisticated digital mini-transmitter with a fully enclosed chain, making the GTS 2000 safer than most other door operators on the market. With its solid 24-volt motor, the GTS 2000 ensures that no unnecessary strain is put on your garage door, as well as providing smooth and whisper-quiet opening and closing. The Glidermatic GTS Optima is Gliderol's premium and most powerful overhead door operator. With the belt safely enclosed in a roll-formed steel section, all components of the GTS Optima are housed within the operator's cover. A low 24-volt motor makes the GTS Optima as quiet as any other belt unit on the market. In an age of technology, the B&D Prodigy™ garage door opener delivers smooth, ultra quiet operation, stylish design and the option of controlling the opening and closing of your door via your smart phone. 5 year/20,000 cycle warranty on the opener including labour to repair. The Controll-A-Door® Smart Phone Control Kit is available as an optional accessory on the B&D Prodigy™ automatic opener. The Controll-A-Door App turns your phone into an additional remote control, able to easily monitor and control your garage door from anywhere in the house, at work, or from almost anywhere in the world! It’s the perfect solution for those of us who carry our smart phone with us all the time. The B&D Controll-A-Door® Advance™ garage door opener is a smart design which effortlessly delivers smooth and reliable door control with the flexibility to vary the door speed and power output according to the type and size of garage door you have fitted. 5 year/20,000 cycle warranty on the opener including labour to repair. 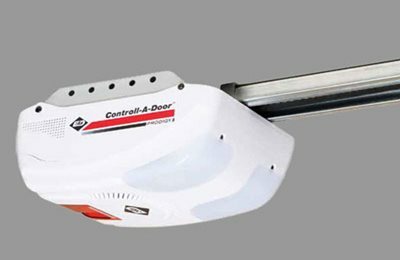 B&D’s Controll-A-Door® S automatic opener is driven by a strong and reliable AC motor. With added features and improved styling it is designed to suit most types of sectional and tilting residential garage doors. 5 year/20,000 cycle warranty on the opener including labour to repair. The PanelPro™ delivers affordable and secure garage door control with the smooth and reliable operation that B&D is famous for. 2 year/ 5,000 cycle manufacturer’s warranty backed by a nationwide team of garage door and opener service professionals. PROTECTION FROM DAMAGE OR INJURY. The smart design of PanelPro™ detects when contact is made with an obstruction and automatically stops and reverses the door to minimise the risk of damage or injury. WORKS WHEN YOU NEED IT TO. Your B&D remote control is designed using the latest Tri-Tran+™ advanced encryption technology so that you can confidently control your garage door, without the threat of interference from other wireless devices. 2 YEAR WARRANTY & NATIONWIDE BACK UP. Rest assured in the knowledge that your B&D opener is backed by a 2 year manufacturer’s warranty and a skilled team of garage door and opener service professionals nationwide to help when needed. BUILT TO LAST. Our range of openers are designed and tested to perfectly match the size of your garage door by delivering the correct amount of power when you need it, year after year. We use our decades of experience to engineer products to withstand Australia’s unique climate. Quiet and quick operation, a great range of features and budget conscious pricing, make the all-new GDO-11 the choice for standard new home doors up to 13.5m2. 3 year / 5,000 cycle parts warranty. TrioCode™ Multi-Frequency Coding Technology - A world leading transmitter system, TrioCode™ multi-frequency coding technology overcomes the all too common interference issues while maintaining security through over 4.29 billion random code possibilities. Quiet 650N DC Motor - The 650N DC motor provides all the torque needed for most doors, all with only a peak 70dB of noise. Soft Start/Soft Stop - Speed ramping throughout each cycle reduces stress on the opener, door and mounting hardware. Steel C-Rails with Chain - The GDO-11 is available with a pre-assembled 1-piece (Order # 00132) or a 4-piece unassembled (Order # 00130) C-Rail configuration. Both are compatible with a 3160mm noggin layout, and can be flush mounted to the ceiling. Battery Backup - In the event of power failure, the optional Battery Backup will keep the GDO-11 up and running. SmartSolar™ Solar Power - Be it a location without accessible mains power or simply a normal residential application, the optional SmartSolar™ unit can power the GDO-11. Courtesy Lights with Independent Operation - Illuminating with each cycle, the courtesy light can also be operated independently of the door. S-ALPS (Semi-Automatic Limits Positioning System) - S-ALPS combines the simplicity of cams style limits setting with electro-optical precision - just move the door to halfway, turn the datum screw and then set open and close positions. After this the door will stop millimetre perfect every time. PG-3 Programmer Compatibility - Access diagnostic and special settings via a simple plug-in. Intelligent Safety System (ISS) - If contact is made with an obstruction while moving, the GDO-11’s ISS will either stop or reverse the door. Door Profiling for Increased Safety - The force needed to safely move the door throughout each cycle is continually re-profiled. By only using the appropriate amount of force, the GDO-11 can more quickly sense, and react to, obstructions in the door’s path. With low noise and economical steel C-Rail, the feature rich GDO-9 Dynamo™ is great for retrofits and upgrades. 3 year / 5,000 cycle parts warranty. Quiet 800N DC Motor - The 800N motor and precision gearing provide immense door shifting torque with a peak noise level of only 68dB. Steel C-Rails with Chain - The GDO-9 is available with pre-assembled 1-piece (Order # 00098) or a 4-piece unassembled (Order # 00099) C-Rail configurations. Both are compatible with a 3160mm noggin layout, and can be flush mounted to the ceiling. Battery Backup - In the event of power failure, the optional battery backup will keep the GDO-9 Dynamo™ up and running. SmartSolar™ Solar Power - Be it a location without accessible mains power, or a normal residential application, a solar charging unit with battery backup can power the GDO-9 Dynamo™. LED Courtesy Lights with Adjustable Time - Illuminating with each cycle, the time adjustable, super-long life LED lights can be operated independently of the door. Door Profiling for Increased Safety - The force needed to safely move the door throughout each cycle is continually re-profiled. By only using the appropriate amount of force, the GDO-9 Dynamo™ can more quickly sense, and react to, obstructions in the door’s path. Intelligent Safety System - If contact is made with an obstruction while moving, the GDO-9 Dynamo™ will either stop or reverse the door. Suitable for doors up to 16.5m2 / 100kg. 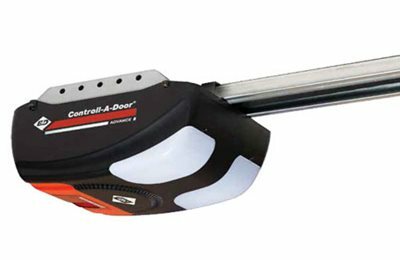 With super quiet operation, belt rail options and a feature rich design, the GDO-9 Enduro™ Overhead Garage Door Opener is Australian-designed world beater. 3 year / 5,000 cycle parts warranty. Quiet 1,000N DC Motor - The 1,000N motor and precision gearing provide immense door shifting torque with peak noise level of only 68dB. Pre-Assembled, Ceiling Flush Chain or Belt C-Rails - The pre-assembled 1-piece C-Rails in chain (Order # 00095) or belt (Order # 00097) options have quick secure brackets to save install time, plus can be flush mounted to the ceiling. Battery Backup - In the event of power failure, the optional battery backup will keep the GDO-9 Enduro™ up and running. Solar Power - Be it a location without accessible mains power, or a normal residential application, a solar charging unit with battery backup can power the GDO-9v2 Enduro™. ALPS (Automatic Limits Positioning System) - ALPS simplifies limits setup through electro-optical sensing, and maintains them to the millimetre even as the door ages. Door Profiling for Increased Safety - The force needed to safely move the door throughout each cycle is continually re-profiled. By only using the appropriate amount of force, the GDO-9 Enduro™ can more quickly sense, and react to, obstructions in the door’s path. Intelligent Safety System - If contact is made with an obstruction while moving, the GDO-9 Enduro™ will either stop or reverse the door. Make your home even smarter, simpler and more secure with our range of great accessories. Battery Backup - In the event of power failure, you can rely on your door providing the security and convenience of automation. This smart item also features a self-protection system to prevent damaging total discharge of the battery. Emergency key release - Allows doors to be disengaged and operated manually from outside the garage, recommended where the garage door is the only entry point to the garage. PE Safety Beam - Protect your family and your car with the PE Safety Beam. As soon an object or person moves through the invisible safety beam, the door will reverse to avert serious damage being done. TrioCode™ Keyring Transmitters - Each of these transmitter’s four buttons can operate a separate function or opener, allowing access your whole home from one convenient unit. Best of all, TrioCode™ technology ensures this transmitter works every time. TrioCode™ Water Resistant Transmitters - Featuring all the benefits of TrioCode™ technology, this sleek unit is also splash resistant. Being caught out in a sudden shower or suffering backfire from a garden hose are no longer concerns for your transmitter, as the smart new design will continue to operate first time, every time. TrioCode™ Wireless Keypad - Be it returning from a bike ride, the kids coming home from school, or the pool cleaner arriving while you’re at work, the weatherproof wireless keypad allows access without a transmitter. With back lit numbers for day or night use, multiple users can have unique codes for specific door and gate access.